The elbow is a hinge joint composed of 3 bones: the ulna, the radius, and the humerus. The 3 main articulations of the elbow are (1) the humeroradial articulation, which is formed by the radial head and the capitellum of the humerus; (2) the humeroulnar articulation, which is formed by the ulnar notch and the trochlea of the humerus; and (3) the superior radioulnar articulation, which is formed by the proximal part of the ulna and the radius. All articulations are contained in one synovial-lined capsule, which typically encases a hemarthrosis following injury. Two main movements occur at the elbow: flexion and extension, which occurs primarily at the humeroulnar articulation, and pronation and supination, which occurs primarily at the radioulnar articulation. Fracture patterns vary widely due to the mechanism of injury as well as the age of the patient. Direct trauma or a fall onto an outstretched hand is responsible for most elbow fractures. Neurovascular injury is a common complication of elbow fractures. The brachial artery is the most commonly injured artery and is seen especially in supracondylar fractures. The median nerve is the most commonly injured nerve, which is often is due to a displaced supracondylar humerus fracture. Intercondylar fractures occur when the condylar fragments are separated. See the image below. They are much more common in adults than in children. Any distal humerus fracture in adults is more likely intercondylar than supracondylar. The mechanism is force directed against the posterior elbow such as a fall onto a flexed elbow, driving the olecranon against the humeral articular surface separating the condyles. Fractures are often a T or Y shaped fracture of the distal humerus. The supracondylar fracture is the most common pediatric elbow fracture (60%) with the average age of 6.7 years and rarely seen after age 15 years. See the image below. Complications include injuries to nerves (the median, radial, and anterior interosseous nerves are the most commonly injured). Vascular injuries should always be suspected with supracondylar fractures. The most common complication for supracondylar fractures are cubitus varus or “gunstock deformity,” which is a loss of the carrying angle and results in more of a cosmetic disability rather than a functional disability (see the image below). In general, an orthopedic consultant best handles decisions regarding reduction of significantly angulated and displaced fractures. If neurovascular structures are compromised, the emergency physician may need to apply forearm traction to reestablish distal pulses. If pulse is not restored with traction, emergent operative intervention for brachial artery exploration or fasciotomy is indicated. 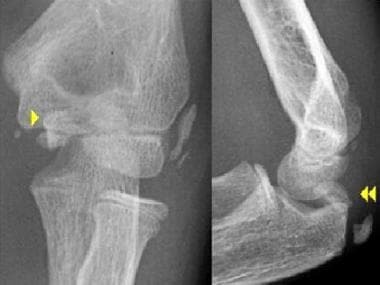 In children, nondisplaced, nonangulated fractures can be splinted (elbow in 90° of flexion); angulated fractures require reduction and splinting; and displaced fractures (see the image below) require reduction and percutaneous pinning on an urgent basis within 12-24 hours. In adults, supracondylar fractures generally require surgery. Ninety-five percent of supracondylar fractures are of the extension-type and are displaced posteriorly due to an extension force. Management of type I fractures consists of immobilization with the elbow in flexion, while type II and II are generally treated by closed reduction followed by pin fixation. Type III fractures have significant displacement and have a high incidence of neurovascular injury and therefore require urgent orthopedic consultation in the ED. Open reduction is reserved for vascular insufficiency with a probable entrapped brachial artery in the fracture site or an irreducible fracture. Five percent of supracondylar fractures are of the flexion-type and have anterior displacement due to a flexion force. The mechanism usually involves direct anterior force with anterior displacement of the distal fragment. Open fractures are relatively common due to the direct force. Treatment of type I fractures is simple immobilization in the flexed position. Fractures of the epicondyles are considered extra-articular. 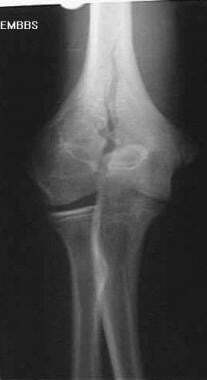 Medial epicondyle fractures are usually in children as an avulsion type injury (see the image below). Mechanisms include posterior elbow dislocation, throwing a baseball (Little League elbow), or a direct blow. Edema and pain over the medial elbow is common. Nondisplaced or minimally displaced medial epicondyle fractures are treated nonoperatively. Fragment displacement greater than 1 cm or valgus instability is often treated with internal fixation. 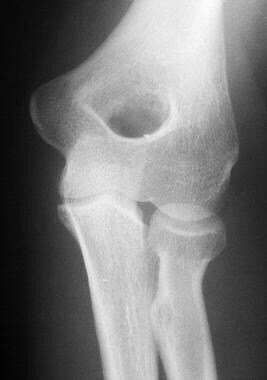 Rarely, entrapment of the medial epicondyle can occur between the trochlea and the coronoid process of the ulna; this can be mistaken for the ossification center of the trochlea. ED management consists of immobilization of the forearm in flexion and pronation and the wrist in flexion. Lateral epicondyle fracture is very rare and is usually due to an avulsion fracture. Medial condyle fracture is rare and is usually found in children. The mechanism is a fall on outstretched hand or excessive valgus stress. This injury is often confused with medial epicondyle fractures. 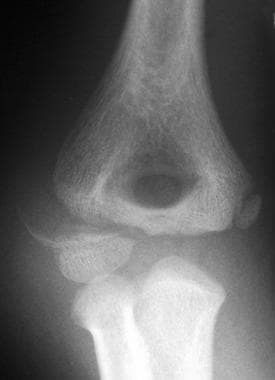 Lateral condyle fracture is usually found in children and is the second most common pediatric elbow fracture. See the image below. The mechanism is a blow to the lateral elbow or from varus stress. Isolated trochlea fractures are rare and are usually associated with other elbow injuries. 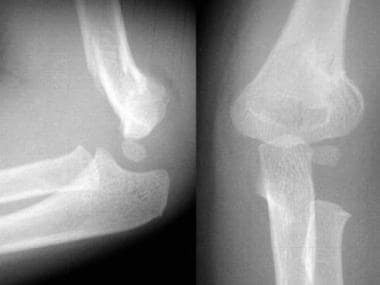 Isolated capitellum fractures are rare as they often occur in posterior elbow dislocations or with radial head fractures. They are usually due to a fall on an outstretched hand. Surgical repair is often indicated. Radial head fracture is the most common of all fractures of the elbow and associated injuries are common. See the image below. The mechanism is usually a fall onto an outstretched hand. 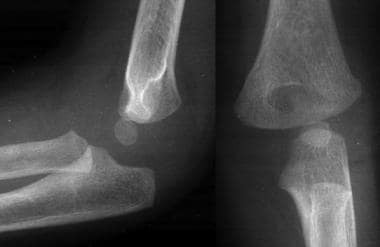 Radial head fracture is characterized by point tenderness at the radial head (located along the lateral aspect of the elbow) and pain with pronation/supination. A specific associated injury, the Essex-Lopresti lesion occurs when the radial-ulnar interosseous membrane is disrupted, causing distal radioulnar joint dissociation. Careful examination of radiographs is important because fractures may be subtle. 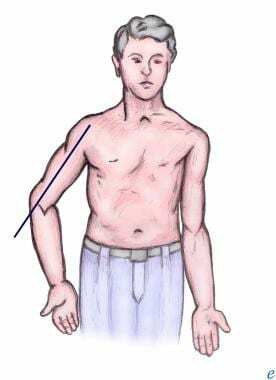 For nondisplaced fractures, a sling with the elbow in flexion is usually adequate. With displaced radial head fractures, patients can be placed in a posterior long-arm splint with the elbow in 90° of flexion and the forearm in full supination and placed in a sling for comfort. The mechanism is usually a direct blow or a fall onto an outstretched hand. See the image below. Patients demonstrate an inability to extend the elbow actively, along with point tenderness at the olecranon. Ulnar nerve injury is common. Patients can be placed in a well-padded, long-arm posterior splint with the elbow in 70° of flexion and the forearm neutral with respect to pronation/supination. Nondisplaced fractures are usually managed conservatively, whereas all others often require surgical repair. Fracture patterns vary markedly among different age groups. Supracondylar fractures are the most common elbow fracture in children because of the relative strength of surrounding ligaments in comparison to bone. Radial head fractures are the most common elbow fracture in adults. Geiderman JM. Humerus and elbow. Marx JA. Marx: Rosen's Emergency Medicine: Concepts and Clinical Practice. 6th ed. Philadelphia: Mosby; 2006. Chap 49. Roust AF, Bredenkamp JH, Uehara DT. Injuries to the elbow and forearm. Tintinalli JE, Kelen GD, Stapczynski JS, eds. Emergency Medicine: A Comprehensive Study Guide. 6th ed. New York: McGraw Hill Text; 2003. 1691-1694. Goldflam K. Evaluation and treatment of the elbow and forearm injuries in the emergency department. Emerg Med Clin North Am. 2015 May. 33 (2):409-21. [Medline]. Gupta R. Intercondylar fractures of the distal humerus in adults. Injury. 1996 Oct. 27(8):569-72. [Medline]. Wilkins KE. Fractures and dislocations of the elbow region. Rockwood CA, Wilkins KE, King RE, ed. Fractures in Children. 4th ed. Philadelphia: JB Lippincott; 1996. 653. Brown IC, Zinar DM. Traumatic and iatrogenic neurological complications after supracondylar humerus fractures in children. J Pediatr Orthop. 1995 Jul-Aug. 15(4):440-3. [Medline]. Nicholson DA, Driscoll PA. ABC of emergency radiology. The elbow. BMJ. 1993 Oct 23. 307(6911):1058-62. [Medline]. Skaggs D, Pershad J. Pediatric elbow trauma. Pediatr Emerg Care. 1997 Dec. 13(6):425-34. [Medline]. Shearman C, el-Khoury GY. Pitfalls in the radiologic evaluation of extremity trauma: Part 1. The upper extremity. Am Fam Physician. 1998. 58:1298. [Medline]. Vinson DR, Kann GS, Gaona SD, Panacek EA. Performance of the 4-way range of motion test for radiographic injuries after blunt elbow trauma. Am J Emerg Med. 2015 Oct 24. [Medline]. Rabiner JE, Khine H, Avner JR, Friedman LM, Tsung JW. Accuracy of point-of-care ultrasonography for diagnosis of elbow fractures in children. Ann Emerg Med. 2013 Jan. 61 (1):9-17. [Medline]. Rabiner JE, Khine H, Avner JR, Tsung JW. Ultrasound findings of the elbow posterior fat pad in children with radial head subluxation. Pediatr Emerg Care. 2015 May. 31 (5):327-30. [Medline]. Kuntz DG Jr, Baratz ME. Fractures of the elbow. Orthop Clin North Am. 1999 Jan. 30(1):37-61. [Medline]. Karlsson MK, Hasserius R, Karlsson C, et al. Fractures of the olecranon: a 15- to 25-year followup of 73 patients. Clin Orthop. 2002 Oct. 205-12. [Medline]. Steinberg G, Adkins C, Baran D. Orthopaedics in Primary Care. 2nd ed. Williams & Wilkins; 1992. 62-85. Anterior and posterior fat pads with radial head fracture.